Even before the rain has stopped and the floodwaters receded, authorities are already predicting that Harvey will be one of the most expensive storms ever. According to the most recent census data, the eight counties of the Houston metro area are valued at $353 billion. The coastal areas from Beaumont to Corpus Christi add another $39 billion in residential value. That is coming close to pushing the residential value at just over $400 billion. That was the value before the storm hit. By mapping the flooded areas so far and estimating the value of the impacted properties, authorities a finding that $145 billion worth of property are at direct risk. 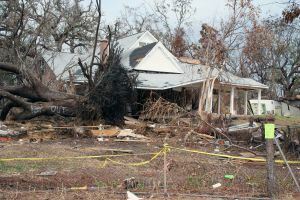 Twelve years ago Hurricane Katrina is said to have cost just over $100 billion in property damage. Only $40 million was covered by private insurance with another $16 billion covered by the National Flood Insurance Program. Unfortunately, most insurers do not offer flood insurance as part of their standard policy. Coverage for flood damage has to be bought as a separate policy from FEMA. This really only comes into play if homes are situated in vulnerable areas. Most lenders require that homeowners get flood insurance in those cases. But what makes hurricane Harvey so different is that the area impacted is so large that even zones that weren’t designated as flood zones are being overrun by water. This means that families will lose home and possessions without any chance of reimbursement. There’s also the interruption to the Houston shipping channel and oil refineries that will have an impact well beyond Texas. There could most likely be a spike in gas prices in the coming days and weeks. Until those refinery and shipping channels get back online those prices are to remain high. The focus now is on rescue and recovery. It won’t be until the floodwaters are totally receded will the true sense of damage be appreciated. Thankfully, there are companies like Junk King Dallas Mid Cities that are standing by to provide fast storm damage removal. No doubt, some of these crews will be making their way to Houston to lend with the cleanup efforts. It’s going to be a long time before things get back to any sense of normalcy for a lot of Texans. This entry was posted in Dallas Mid City Junk Removal and tagged flooding, hurricane, storm damage on August 31, 2017 by Junk King. Last updated August 31, 2017 .